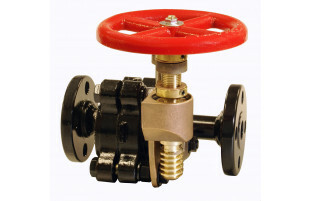 Model 725 Slow Opening Flanged Blow Off Valve - United Brass Works, Inc. 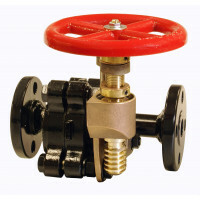 The United Brass slow opening boiler blow off valve has been designed for the rugged service of boiler treatment and scale. The cast steel knife gate valve conforms to Class 300 of ANSI B16.34 and features a stainless steel seat and disc hardened to Rockwell 60. ASME Boiler and Pressure Vessel Code Sections 1 PG-42.1.12 and Power Piping Code ASME B 31.1 Table 126.1 reference steel valves to ANSI B16.34. The sliding disc provides a cleaning action that keeps the seating area clear of scale and debris.